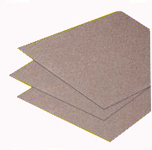 50 Lighweight chipboard pads strengthen envelopes and mailers so your photos don't get bent, or place behind photos in frames. .022 thickness. Choose size. Also available: 25 pieces 8.5"x11" Corrugated pads/dividers used to protect photos when shipping, or as spacers in framing. 200 lb. test. 1/8" thick.